Let me start by saying I appreciate you taking the time to read this. Ill try and keep it short and sweet. After alot of loss and heartache the last five years (late husband died in Iraq) I am getting married again. Its been a long journey to get here but I am happier now then I have been in years. MY REQUEST: I am wanting someone to design poser characters or 3d of my fiancee and I in our wedding attire if possible. I have very detailed photos of the wedding gown and the tux. We are having a western/elegance reception and ceremony. Im hoping that by reaching out like this I may find someone who might be up to the challenge of doing this (if its even possible). Just in case you do not get any or many replies to this request, I just want to let you know that the folks here at the DAZ forums are not a bunch of mean jerks ignoring you. You indicate you are new to 3D and probably are not familiar with recent events here at DAZ's forums... DAZ recently changed it's website software and as a result there were a bunch of issues... one of which makes it "sightly" more difficult to find recently posted threads... as such, in a day or so your thread may not show up in an easy enough manner so people casually looking at the forums will notice it. DAZ is probably going to fix it eventually, but at the moment they are having far more pressing issues with the afore mention website changeover and it is not a priority at the moment. Its like after a flood... you sort of stop worrying if the carpet is wet and are just happy the tabletop is above water so you have somewhere to sleep. That having been said and noting your statement about not knowing much about 3D modeling, I thought it would be to some degree "helpful" to point out that the nature of your request is a bit difficult... the creation of clothes for CGI figures is one of the most difficult modeling tasks around, and as such, the few good modelers who do make clothes tend to "have to" charge money for them due to the difficulty and number of hours involved... especially when it is of a specific type of clothing. There are many who do make free clothing, but often a request as such represents a great challenge and many hours of intense work, and usually it is not something a lot of freebie clothing modelers feel they wish to engage in. Its nothing personal, its just sort of like one person asking "could you build me a bike" and someone else asking "could you build me the Ferrari 458 Spider from the 2011 Frankfurt Motor Show"... there is almost that big a difference in what is involved. I am a modeler and I have yet to tackle clothing (one because I have little interest in making clothes... heck, I hardly even wear em') but I have experimented with the fundamentals and I can tell you- IT IS HARD. I don't want to discourage you or make you think you are being rude to ask, I just thought that in case you don't get the sort of reply you are looking for there are a few possible reasons for it. Also, I am sorry to hear of your loss and I am happy you have found someone who brings you joy again... good luck with your request and have a great wedding. 1- It would also be helpful for others to know what software you own (DAZ Studio or Poser). 2- Also are you willing to buy a preexisting set of clothing if it is close to what you need? 3- If you don't own or know how to use DAZ Studio (version 4-Pro is still free) and are hoping someone can also make a render (final image) for you, you should also state this. 4- It would be helpful to post an image or two of what the actual outfits look like, this way a person who may have the skills to make it or know of a similar preexisting out fit can help you. I"m pleased to hear that things are looking up for you. lordvicore is correct that it would be helpful to see an image of the outfits involved. What might be possible would be if someone helped with outfits, someone with the face morphs and then maybe some of us could walk you through setting up the render. The skills required for the outfit and the morphs are quite different. You will often find someone who is skilled at modelling/texturing is not as skilled at morphing characters. So I'm going to settle here with a cuppa and hopefully you can load up some images of the outfits so we can help decide if we can retexture something already available or whether a modeller is required. Ladies, thank you so much for your response as well as the additional information. Im attaching pictures of the dress and the tuxedo too. I have also included a pic of how I will be wearing my hair and our save the date card. The only difference with the dress is that where you see red, it is being made with royal blue instead. My fiancees vest will be white satin. Let me know what else you may need and where I need to proceed from here. Once again Thank You!!! I think that there may be stuff we can use just by retexturing. IIRC there is the something by Cute3D or someone similar to the dress. I know that there is probably something for M4 that can be used. Give me a little while to get some links organised as my grandkids just rocked up. Ladies, thank you so much for your response as well as the additional information. lol...I thought you were guy! Quick render of the morphing fantasy dress. Some ruffling around the hem due to the autofit to Genesis. The V4 dress has more morphs than the Genesis one. 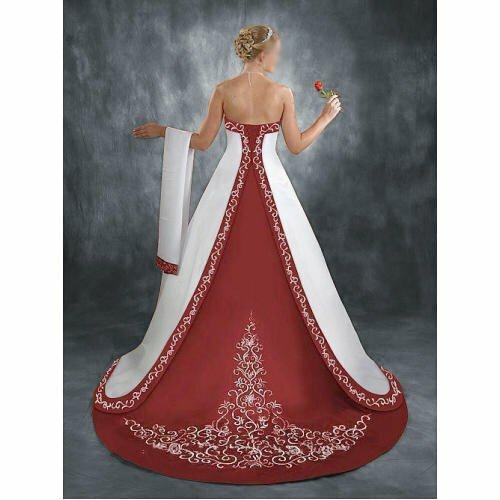 I would be willing to attempt to do the texture for the dress but I would need high quality images of the embroidery details as well as the reference photos you already posted. Haven't looked at what is available for the tux but I'm sure there is something in M4's wardrobe. This has just been quickly thrown together and you can see why I would need higher quality images especially of the details. I'm glad you like what I've done so far. It still needs a lot of work. Better quality images would help for the details. You'll still need to locate someone to help with the morphs for the faces and bodies. The dress I'm using is the morphing fantasy dress for v4. The genesis version does not have as many morphs. Still have to locate a suit for tux but I'm reasonably sure there is something that will do. With the images if you can get some clear images of to embroidery where possible flat on without distortion that would help. Sorry for errors I'm doing this from an iPad. LOL, Ok thank you Miss Pen and Mr. Lordvicore. I am new to this whole thing so please bear with me. I will get you detailed photos as the dress will be here this week. Do you need more detailed photos of the tux and the back design of the dress as well? My wedding colors are Royal Blue, Silver and white, mixed with irridescent pearl. Im adding two photos for you one is our save the date card, incorporating western with elegance and a photo collage of my fiancee and I. Detailed photos of the tux and the back design of the dress would be good. So is the blue I'm using close enough? Your images are lovely. You will still need to get someone to do morphs for both of you if you want to make it more realistic. Hope this make sense... I woke up this morning full of cold. She said she can pull the faces of the Victoria and Michael characters to match my fiancee and I. So it looks like you are making my characters come to life for me. :) I can not thank you enough!!!! Let me know if you require anything else. I will get you the detailed pics soon. Once again Thank You!!! I'm glad you found someone to do the faces. I will hold off doing it properly until I get the more detailed pics. I should be able to get the dress colour off of the images. I have no idea where the time has gone but I just realized the wedding is only 9 weeks away. I apologize for not getting you more detailed pictures sooner. Life it seems has gotten in the way once again. Im attaching the actual swatch of the bottom of the dress and the detailed photo of the back design from the original photo. I have my wedding gown but because i live with my fiancee i am unable to keep the dress in the home and as such have not been able to take photos of it. I hope this is the additional photos that you would need to finish the clothes for the renders. Please let me know what else I can help you with.... I may need your e mail as the pics I have of my dress are to large to put on here..